Wood, Larry. "Luge and Skeleton Bobsledding". The Canadian Encyclopedia, 13 February 2018, Historica Canada. https://www.thecanadianencyclopedia.ca/en/article/luge-and-skeleton-bobsledding. Accessed 20 April 2019. Tobogganing developed independently in eastern Canada among native tribes who used their transportation sleighs for occasional fun. It was refined by groups such as the Montreal Tobogganing Club, the first such club in Canada, formed in 1881. Pierre Lueders (left) and Dave MacEachern with their bobsledding gold medal (courtesy Canadian Olympic Association/photo by Mike Redwood). A bobsled on course during the 1988 Olympics at Calgary (courtesy Take Stock Photography Inc). Sledding, or tobogganing, was first recorded in the 16th century. Modern racing began in Switzerland in the mid-19th century. Three forms of tobogganing developed: a bobsleigh, or sleigh, has 2 axles and 2 pairs of runners, is steered with a wheel, rope or bungie cord and is operated by teams of 2 or 4 racers; luge uses a single sled (a 1- or 2-seater) with the rider lying back from a sitting position; in Cresta tobogganing the rider lies on his chest. In the later 19th century skeleton was introduced, where a single athlete slides on a sheet-like sled face down and head first in the prone position. Most sleds could take as many as 4 riders; some accommodated 12. Tobogganing was one of Canada's prime winter sports in the 19th century. The Montmorency Ice Cone, outside Québec City, was a popular site for recreational sledding. When the sport grew less popular in Canada after the 1880s, the original toboggan runs were abandoned. Canadian competitors were forced to practise in Europe or at Lake Placid, NY, until 1985, when the Bobsleigh and Luge Track, built for the 1988 Winter Olympic Games, was permanently opened at Calgary Olympic Park. A track was also constructed in Salt Lake City, Utah, for the 2002 Winter Olympics and has been in operation since 1997. Skeleton was also reintroduced during the 2002 Games. Bobsleigh racing started in 1881. Today 31 countries participate. It is a highly technical and physically demanding sport. Pushing the steel and fibreglass sled (the 2-man sled weighs 210 kg and the 4-man, 390 kg, without crew) from a dead start takes great strength, speed and timing. The driver's skill in maneuvering 16 curves over the 1500 m course while taking the "fastest line" can mean the difference between winning and losing. Speeds can reach up to 150 km/hr, and the crew experiences up to 5 G's of gravitational force. The Canadian Amateur Bobsleigh and Luge Association was formed in 1957 and the first Canadian team entered international competition in 1959. In 1962, a 4-man team led by Lamont Gordon won the Commonwealth bobsleigh championship. The EMERY brothers, Victor and John, who had formed the Laurentian Bobsledding Association in 1957, began racing in world competition in 1959. By 1964, with Douglas Anakin and Peter Kirby, they had gained the experience necessary to challenge the world's best at the Olympic Games at Innsbruck, Austria. Despite few opportunities to practise, they set a record time in their first run and won the gold medal. 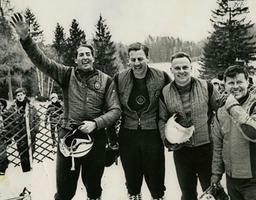 The Canadian team, again led by Vic Emery, retained its title at the 1965 world championships. 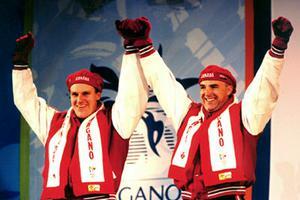 Canadian sledders, led by Greg Haydenluck and Chris Lori, returned to international competitiveness in the late 1980s. Both drivers (now retired from competition) won World Cup races and placed consistently in the medals in both 2-man and 4-man competitions. In 1998 the 2-man bobsleigh team of Pierre Lueders of Edmonton and David MacEachern of Charlottetown won gold in the Winter Olympic Games in Nagano, Japan, finishing in an identical overall time with the Italian team. Lueders managed to secure a spot on the Olympic team at the 2002 Salt Lake Olympics where he placed 5th and 9th in 2- and 4-man competition. Lueders continued to have successful runs with other partners, consistently placing at the top of world standings in the years that followed, and he achieved Olympic success once again when, in 2006 at Torino, he and Jamaican-born bobsledder Lascelles Brown beat the odds in severe weather to win the silver medal. Pierre Lueders continues to be Canada's most renowned bobsledder, and prior to the 2010 Olympics he had amassed 8 world championship medals and 88 World Cup medals in addition to his gold and silver Olympic wins. Canadian bobsledders had their best-ever Olympic year in 2010 at Vancouver. Canadian female bobsledders Kaillie Humphries and Heather Moyse, along with teammates Helen Upperton and Shelley-Ann Brown, won gold and silver medals respectively. The 4-man bobsled team of Lyndon Rush, Chris LeBihan, David Bissett and Lascelles Brown won bronze. Lueders and his teammates placed 5th in both the 2- and 4-man events. Luge racing began in 1879. Today over 30 countries participate in 3 events: men's singles, women's singles and men's doubles. The luger must maintain a prone position while maneuvering hairpin turns over the 1000 m (for men) or 750 m (women) track at speeds up to 150 km/hr or more. Although Douglas Conner set a world record in the Cresta run at St Moritz, Switzerland, in 1954, Canada's first luge team was not formed until 1967, when the first Canadian championships were staged. A luge team entered the 1968 Olympics and Linda Crutchfield won the 1968 North American women's luge championship. Canada finally gained modern facilities in 1976 with a 213 m luge run built in Etobicoke, Ontario. In 1977 Carole Keyes and Bjorn Iverson won the North American women's and men's luge singles championships; Larry Arbuthnot won the men's championship in 1978. Czech-born Miroslav Zajonc, racing for Canada, won the world luge championship in 1983 and, to date, his is the only international medal Canada has won in luge. Marie-Claude Doyon ranked 6th in the 1986 overall World Cup standings. This sport, also known as Naturbahn, has recently gained acceptance in Canada, with some 3000 participants and 8 tracks, including a world-class facility at Canada Olympic Park, Calgary. The tracks vary from 50 to 1000 m and can be constructed anywhere there is a snow-packed or ice-covered hill; there are no turns. The slider lies down, feet-first, and steers by pulling on a strap. Informal competition speeds start at 30 km/h and can reach 80 km/h. The sport takes its name from the natural terrain and winter weather that form the track used for racing. The sport of natural luge made its debut in Canada in 1984, and Canadian sliders attended their first world championships in 1986. Canada's best result to date has been a 6th-place finish by Sonja Dobson in 1998. 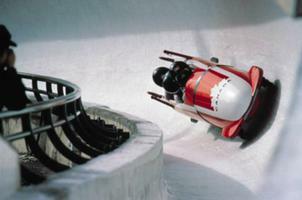 Calgary has one of the premier combined bobsleigh/luge runs in the world, in operation since March 1985. Skeleton (sled) racing, a form of singles tobogganing, is considered the world's first sliding sport. 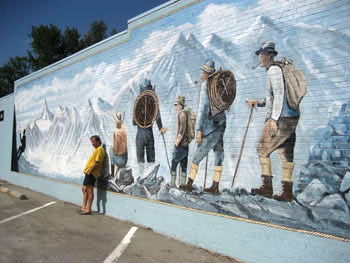 It originated in the Swiss resort town of St. Moritz in the late 1800s. The first competition was held in 1884 but it wasn't until 1887 that riders began competing in the prone position used today. Riders raced down the road, east from St. Moritz to Celerina, where the winner received a bottle of champagne. The route followed the same general path as that of the famed Cresta (toboggan) run, which has been a unique St. Moritz winter-sport attraction for decades. The sport was named in 1892 when a new sled, made mostly of metal and resembling a human skeleton, was introduced. The Federation Internationale de Bobsleigh et de Tobogganing (FIBT) was founded in 1923 and, 3 years later, bobsleigh and skeleton were declared Olympic sports. Men's skeleton made its Olympic debut in 1928 at St. Moritz. Brothers Jennison and John Heaton of the US won the gold and silver medals, respectively. In 1948 at St. Moritz, Nino Bibbia of Italy won gold and John Heaton repeated his silver medal victory. After the 1948 Games, skeleton was removed from the Olympic program. Today, competitions exist for both men and women. The discipline differs from other sliding events in that the competitor lies flat on his or her stomach in the prone position on the sled with head forward during the slide. Once the start is signalled, the athlete has 30 seconds to begin the run (trip the clock). The only means of acceleration is by the athlete's own push at the start of the race. The athlete may leave the sled in order to push or move it, but must pass the finish line on the sled in the prone position. Olympic skeleton competition consists of 2 runs timed electronically to hundredths of a second. Devices to assist steering or braking are prohibited. Men and women use the same type of sled - 80 to 120 centimetres long and 8 to 20 centimetres high - but weight restrictions are less for women than for men (92 kg and 115 kg respectively). Canadian interest in skeleton racing resurged in 1986 with the opening of the Canada Olympic Park track in Calgary. The Austrians and the Swiss dominated the sport until the mid 1990s when Calgary's Ryan Davenport and his custom-made sleds surged to the top. Davenport is still the sport's only two-time world champion (winning in 1995-96 and 1996-97). He also won the overall World Cup title in 1996. 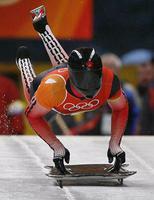 Skeleton returned to Winter Olympic Games competition in 2002 at Salt Lake City. The early 21st century saw the emergence of several young sliders who made their way onto the international podium. Michelle Kelly won 2 World Cup silver medals, in 1999 and 2000. Women's skeleton made its Olympic debut in 2002. Canada's celebrated racer Mellisa Hollingsworth, the World Championship silver medalist in 2000, took the Olympic bronze in the event's inaugural year, and in 2010 she placed 5th at the Games in Vancouver. Canada's men also continued to dominate internationally. Jeff Pain is Canada's most decorated skeleton racer, having won several World Cup gold medals from 2000 to 2006, and a world championship title in 2005. Racer Duff GIBSON won gold in Olympic skeleton in 2006, though Pain was heavily favoured to win. 39 years old at the time of his win, Gibson currently holds the record for being the oldest individual gold medalist in Winter Olympic history. Leading up to the 2006 Games, he placed 2nd in the 2003-04 World Cup standings, won the 2004 world championship title, and finished 3rd in the 2004-05 World Cup standings. He retired shortly thereafter. 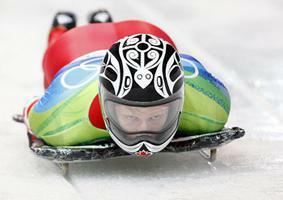 Canada's skeleton racers excelled again at the 2010 Vancouver Winter Olympic Games. Jon MONTGOMERY won Canada's second consecutive gold medal. He finished the four runs, reaching speeds of over 145 km/h, in a combined time of 3.29.73, besting Latvia's Martins Dukurs' time of 3:29.80 and the final time of 3:30.75 by bronze medalist Alexander Tretyakov of Russia. Hollingsworth was fifth in the women's event. Canadian Luge AssociationCheck out the history of competitive luge racing in Canada and the latest news about the national luge teams. Bobsleigh Canada SkeletonWebsite for the national governing body for the sports of bobsleigh and skeleton in Canada. See the latest news about national teams and related events.